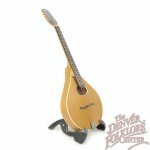 There is no denying that Bruce Weber is among the legendary names of the mandolin construction world and this simple but elegant custom Weber Hyalite Octave Mandolin is a great reminder why. 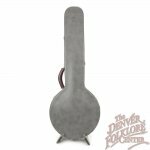 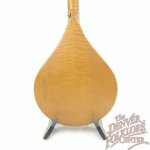 A satin Buckskin colored finish adorns a beautiful tight grained spruce top and highly figured maple back and sides while the tasteful grained ivoroid binding wraps the soundboard and triangle (or sometimes referred to as D shaped) sound hole. 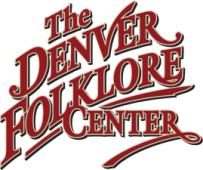 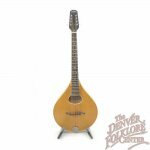 Tonally this piece is rich and full bodied with ringing overtones and a deep bass- everything you would expect out of an exquisite Weber Octave Mandolin. 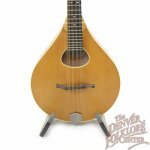 Although designed for Celtic playing the Hyalite could also fit excellently into a classical mandolin ensemble or in a bluegrass group looking for a little different should. 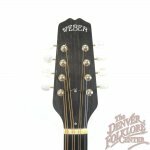 The instrument is in excellent condition with only slight signs of play and also includes the original hardshell Weber case.